If you are feeling pain in the right/middle upper abdomen or upper portion of the back from several hours. It may be the cause of ‘Gall Bladder Pain’. 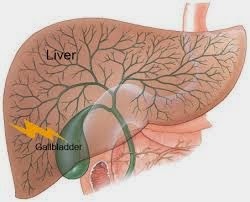 Problem in the gallbladder (pitta) may disturb our body functions. Bile from the liver is very important for our digestive system to digest fatty food. Fever, yellow eyes and skin, headache, constipation, dark colored urine, sweating, weakness, difficulty in breathing and vomiting are the symptoms of gallbladder pain. This pain may caused by gallstones. Inflammation (cholecystitis) can be causes of gallstones in the gallbladder. Skipping breakfast and be hungry for a long time may cause for gallbladder pain and gallstone. People over 60 years mostly suffer from this pain. History of gallstones in the family, diabetes and dietary disorder like high fat and low fiber diet may cause pain. Use more vegetables and avoid spicy or junk foods. Females are more affected than males especially in pregnancy period. The following home remedies for gallbladder pain and stones removal. Eat Pear how much you can it may reduce from abdominal pain. Pear juice helps to clean the gallbladder. Apple Juice 8 tablespoons, 1 tablespoon of Ginger juice and 1 tablespoon of Apple cider vinegar may relieve you completely within 25-30 minutes. Coffee may reduce the causes to develop the gallstones 40-50%. Use daily 2-3 cups. Beet, Carrot and cucumber juice in equal quantity may reduce the pain and continues use of beet in salad may decrease the symptoms of gallbladder pain. Olive Oil (1 tablespoon), Lemon Juice (1 tablespoon) before breakfast is very useful for gallbladder pain and can dissolve gallstones. Drinking grapefruit juice with breakfast is helpful to digest the Oil. Turmeric in your daily meal may help to remove stones and the pain of gallbladder. Chicory seeds with yogurt are very effective to reduce the pain. Continued use of it may treat gall bladder. Omega-3 fatty fishes may avoid gallstones and gallbladder pain. Eat more fatty fish. Dandelion juice and use as salad daily may dissolve the gallstones and improve the health of the gallbladder. Dandelion tea is also very effective. Thistle milk contains silymarin which can cure you from gallstones and pain.